wonderful snack, it makes a great sandwich bread—just slice it in half and fill it with something wonderful, like prosciutto, buffalo mozzarella and arugula. I’ve added some semolina flour to the dough in this version, but you can make it with 4 cups of all-purpose flour instead, if you like. 1. Place the water in the bowl of an electric mixer and sprinkle the yeast over. Let stand for 1 minute, until creamy. Stir with a fork to dissolve yeast. Stir in the milk and olive oil. Add the flours, rosemary and salt and mix, using the paddle attachment, until a soft dough forms. 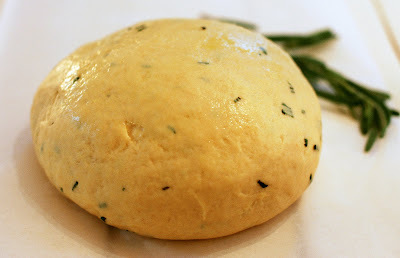 Switch to the dough hook and knead until smooth and elastic, adding more flour if dough is sticky, about 10 minutes. 2. Transfer dough to a large oiled bowl, turning to coat it all over. Cover loosely with a tea towel and let rise in a warm place until doubled in bulk, about 1 ½ hours. 3. 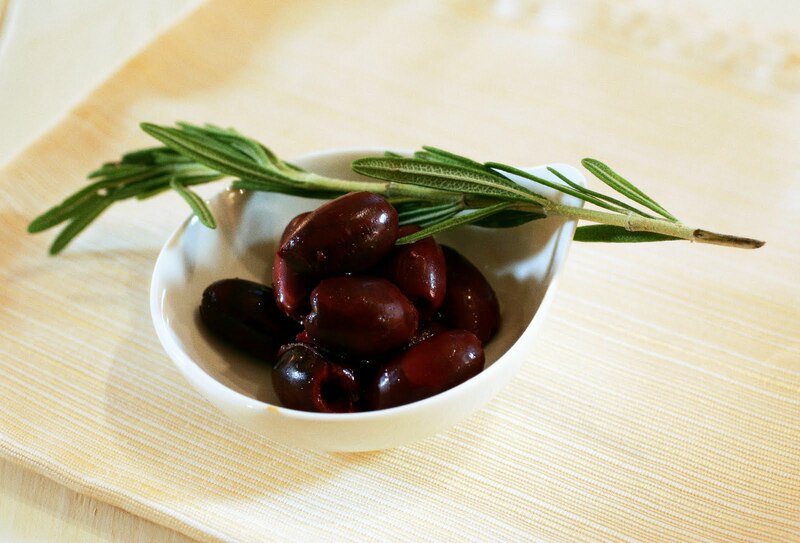 Coat a 15 x 10-inch baking sheet with 1 tablespoon oil. 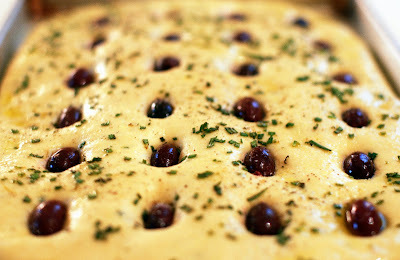 Punch down dough and transfer to prepared sheet. Using fingertips, press out dough into a rectangle that covers the bottom of the pan (or almost covers it). Let dough rest 10 minutes. Drizzle about 2 tablespoons oil over dough. Sprinkle chopped rosemary evenly over. Let dough rise uncovered in warm area until puffy, about 25 minutes. Meanwhile, preheat the oven to 400°F. 4. Using your finger, press down to create 24 indentations evenly spaced over the top of the dough. Place an olive half, cut side down, into each indentation. Sprinkle dough with salt and fresh ground pepper. 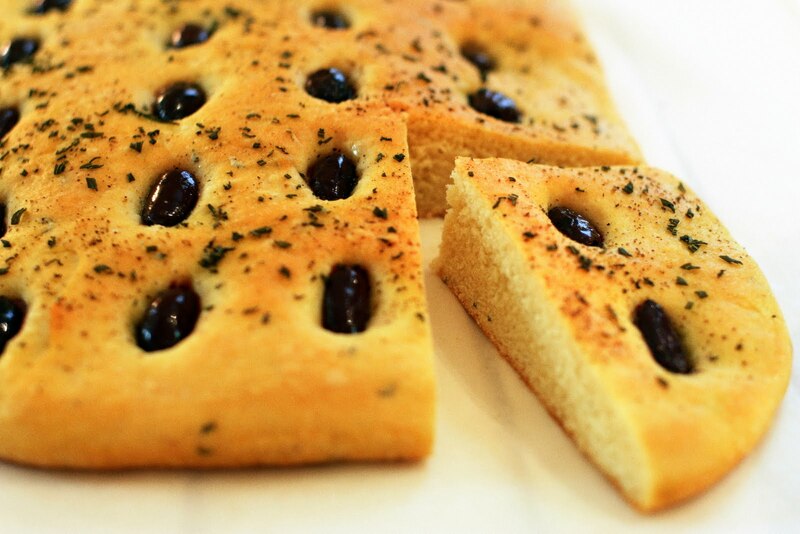 Bake focaccia until brown and crusty, about 20 minutes. 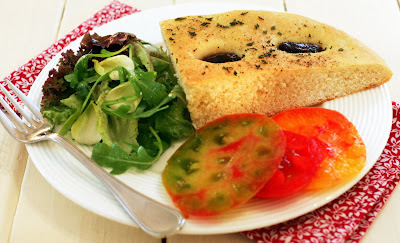 Serve bread warm or at room temperature.